A Printable Crossword Puzzle All About Corny Jokes! In this printable crossword puzzle, every clue is joke or riddle -- a very corny one, in fact! If you can come up with the same answer I did, then you’ll have no problem completing this puzzle. But then again, it may be a bit more difficult than it sounds. DISCLAIMER: There may be more than one answer to some of these groaners, and you may not think these are funny at all. But I’m guessing you’ll love solving this crossword! 4. Where were the first donuts fried? 9. What is a diver’s favorite game? 13. What do rock musicians use when they get hurt? 16. What pets do musicians like? 19. If a seagull flies over the sea, what flies over the bay? 22. What cannot run even though it has three feet? 23. What did the mother buffalo say to her son before he left? 25. What’s the most popular tune? 26. What is brown and sticky? 27. What do you put in a barrel to make it lighter? 28. What do you call an angle that’s been in a car crash? 2. What do you call a boy hanging on the wall? 3. What do you get when you cross an ear of corn with a spider? 5. How did the computer feel after its memory had been upgraded? 7. How to you throw the best party in the universe? 8. What has teeth but doesn’t bite? 10. How do you get an astronaut’s baby to fall asleep? 11. What can be divided, but no one can see where it was divided? 12. What kind of waves are impossible to swim in? 14. What do cats have that no other animal in the world has? 15. What kind of fish like peanut butter? 18. What kind of music can you play with your toes? 21. What musical instrument is not to be believed? Try Another Printable Crossword Puzzle! While you're here, why not try some of these fun crosswords? Use the links at the bottom of the page to find lots more, arranged by difficulty. The Grimacing Gardener - Here's a printable crossword puzzle free for the weeding, hoeing and growing! Inspired by a recent encounter with poison ivy, I've written this puzzle challenging plights and pestilence associated with gardening. 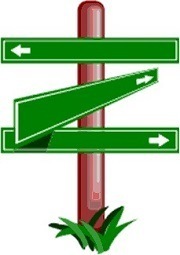 Road Signs - Follow the signs for a fun, easy crossword puzzle. Simply supply the message shown on the sign. Quick and simple for kids and adults alike! U.S. Holidays and Observances There's so much to celebrate! Check your knowledge of lots of special days, anytime of year. Movie Crossword - We supply the year and two actors. You supply the title of a popular film. Fun and challenging! Commuter Crossword Puzzles You shouldn't need a crossword puzzle dictionary to solve this, making it the perfect crossword puzzle free for commuters. Print out an extra copy or two to share with your co-workers. Where In the World? Test your knowledge of famous locations around the world. It's a great printable crossword puzzle for Geography buffs, family night or Social Studies class!